ET06-Health Professionals Curriculum in Context Following a recent presentation (to a validating panel) of the curriculum "Health and Social Care Course for Learners with English as a Second or Alternative Language", this assignment will provide commentary to accompany the presentation and will address; The rationale behind the creation of the curriculum including influencing external factors, such as; social, economical, cultural and technological influences; examining STEEP and SWOT factors, how the curriculum will be integrated into proposed host organisations and how it will be marketed, the assignment will also demonstrate the supportive theory and literature used to underpin the curriculum issues and it will conclude with a reflective evaluation upon the practical effectiveness of the curriculum. The curriculum "Health and Social Care Course for Learners with English as a Second or Alternative Language" consists of a three-tier course that address' health and social care education, literacy and numeracy (skills for life) and the education of emigrant workers (See appendix One). The course is progressive in levels and commences with a beginner course followed by a common induction course and finishes with an advanced course. Each course lasts ten weeks in length and progresses in levels of difficulty. Kelly (1999) defines curriculum as "all the learning which is planned and guided by the school.." This definition is focused on compulsory education so does not really have bearing on the curriculum presented here for the further education sector, however, I like the definition because it states that curriculum is about learning and not just a syllabus which many people still relate the curriculum to. ...read more. Threats * Acute trusts and private trusts may have own in-house training. * New legislation limiting entry to nurse education. If desired, one can also use the work of Lewin (2007) who created a force field analysis of pros and cons to aid decision-making in management. The STEEP and SWOT factors examined show clearly the reasoning to go ahead with the curriculum therefore Lewin can be examined in appendix Two. Having considered the influencing factors upon the proposed curriculum, a marketing strategy must be developed and adopted. Areas for this have already been illuminated in the SWOT analysis. The strong influencing factor that presents, is the possibility of the course being funded. The local Learning and Skills Council (LSC) (2006) published their annual plan in May. Within this plan, national and regional priorities are stipulated. These priorities are where the LSC intend to inject cash funding. Continually mentioned throughout the report are the priorities for skills for life provision and health and social care qualifications. Migrant workers are mentioned in the report as a stand-alone priority, as a target to cover a/ improvement in achievement of skills for life (literacy, numeracy and information and communication technology) and b/ employability and educating the worker to meet public demands. Therefore, all areas of the proposed curriculum meet the local LSC planned agenda, therefore presenting a strong possibility of the course being funded by them. A fully funded course would appeal as a marketing attraction in it's own right, and this would be a valuable selling point to employers. ...read more. Externally, review questionnaires will be sent to those employers who recruit successful learners, this will illustrate changes in behaviour and identify the benefits or shortfalls from the course from the point of view of the public interest and the industry. Although the course could be sent to an awarding body for accreditation, this is costly and quality assurance comes free by means of external inspection. The commission for social care inspection evaluate and monitor training and compare the effectiveness of training to standards, therefore, within my own organisation quality assurance would take place effectively. Following the presentation of this curriculum to a validating panel, I feel running the curriculum would be very effective. I have considered external influencing factors and I have completed a SWOT analysis to identify any pitfalls. I have designed the curriculum to a model and ideology and I have ensured that quality assurance, marketing and funding do not contain any influencing factors to withdraw the curriculum, it has been proved that funding is actually a unique selling point of the curriculum. The validation panel saw no weaknesses in the proposals. Therefore, the curriculum will be launched. 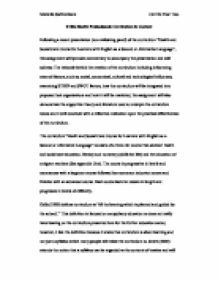 This assignment has explored the rationale behind the creation of the curriculum including influencing external factors, such as; social, economical, cultural and technological influences; it has examined STEEP and SWOT factors. An explanation of how the curriculum will be integrated into proposed host organisations has been given along with an illustration of how it will be marketed. The assignment has demonstrated the supportive theory and literature used to underpin the curriculum issues and has concluded with an evaluation upon the practical effectiveness of the curriculum. Michelle Swithenbank Cert Ed Year Two ...read more. A foundation for his personality is being laid. At age three, he moves into the next stage which Dr Montessori calls the Conscious Absorbent Mind. The Conscious Absorbent Mind is active from age three till age six. The unconscious Horme gives way to the conscious Horme. Safeguarding was one of the five outcomes in 'Every Child Matters' (DfES, 2003) and this was made law by the Children's Act 2004 (HM Government, 2004). (KU2) By safeguarding and promoting children's wellbeing I am developing my practice continuously as these policies are constantly being reviewed and updated in relation to any new legislation, these are essential requirements that I follow. I am therefore very enthusiastic about accommodating learners with barriers to learning in ordinary schools. Inclusion can be a very daunting task for educators but if we look at the successes in other countries, I believe that inclusion can work and be effective in South Africa. LSAs will work alongside tutors in the classroom, helping learners to get the most out of their education. There is also a separate learning support department where LSAs can work with individuals or small groups away from the classroom on work that complements the work being delivered in the subject. Therefore since then attitudes and beliefs have changed and integration was introduced and considered as a step forward. Integration made it essential that the children fit in with mainstream schools alongside a mix of other children to enhance their self-esteem. Essays on Curriculum Development and Implementation for Inclusive Practice (with tutor feedback).